Madeleine Kuderick’s gripping debut is a darkly beautiful and lyrical novel in verse, perfect for fans of Sonya Sones and Laurie Halse Anderson. Kiss of Broken Glass pulses with emotion and lingers long after the last page. In the next seventy-two hours, Kenna may lose everything—her friends, her freedom, and maybe even herself. One kiss of the blade was all it took to get her sent to the psych ward for seventy-two hours. There she will face her addiction to cutting, though the outcome is far from certain. When fifteen-year-old Kenna is found cutting herself in the school bathroom, she is sent to a facility for mandatory psychiatric watch. There, Kenna meets other kids like her—her roommate, Donya, who’s there for her fifth time; the birdlike Skylar; and Jag, a boy cute enough to make her forget her problems . . . for a moment. Oh wow. 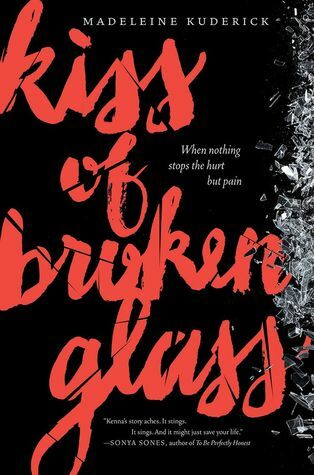 After reading the first page of “Kiss of Broken Glass” I knew I was going to love it. It definitely is a unique book, and if you don’t like the genre you probably won’t enjoy the story. That being said, I absolutely devoured this 200 page novel, reading it in one hour. The writing style Kudrick uses is especially intriguing—free verse. This is the first book I’ve read in this poetic type, and I enjoyed it immensely. The story spanned three days and it was just long enough. Closer to the end the main character Kenna had some minor convictions spiritually. That was definitely an unexpected plot twist. Even though it wasn’t a happy, fun read it had a touch of romance here and there. All the empathy between the characters made for some great friendships and sad goodbyes. One of the most important things when writing a book on such a deep topic is understanding that readers can only take certain amounts of emotional storyline before we need a Judge Judy joke; I think Kudrick understood that.